Outlook Automatic reply messages for when you are away from your desk. Microsoft Outlook Auto Reply tool – Email Responder. 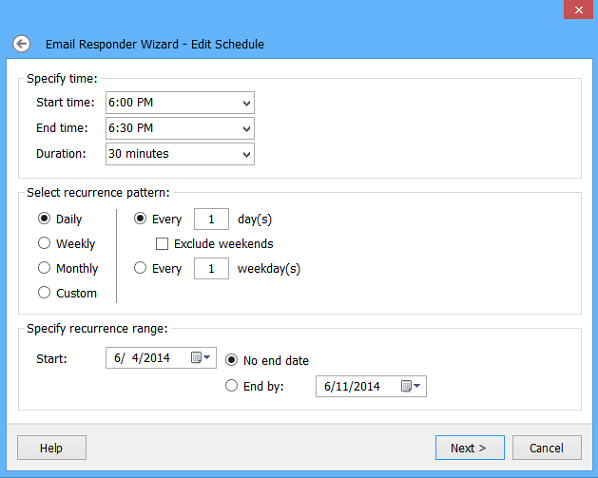 By enabling the Auto-Reply Scheduling option in the Email Responder Wizard dialog, you can apply custom scheduling preferences for the selected Status. Specify time intervals when you are out of the office and set recurrence options to follow. Select a time interval (Start/End time) for the selected Status to be turned on, choose recurrence pattern/range (Daily/Weekly/Monthly) or select a custom schedule mode. „Scheduled Status types“ in the Email Responder menu allows viewing a list of scheduled status types and apply changes to the particular status scheduling or edit auto-reply templates. Autoresponder to send instant replies according to your Calendar or Skype status. By using the Outlook Automatic Reply option of Email Responder, you can reply all the emails you receive according to the rules you’ve created and status of your default Outlook Calendar or Skype. 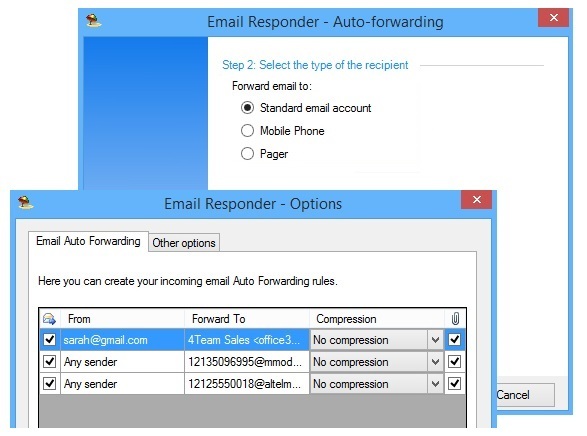 By using the Email Responder auto-forwarding option, you can redirect all or specified incoming email messages to another email account. You can set up auto-forwarding rules, specify recipients and select message compression options. Just choose any sender or select email addresses from your Outlook Contacts and specify email messages you would like to forward automatically even if you are away from your computer. 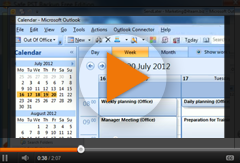 After the Email Responder out-of-office reply assistant is installed, you will find its Status icon and Status description on the Microsoft Outlook toolbar. Enable or Disable Email Responder, create and manage status types and templates to manage your Out of Office reply assistant easily. You can access all Email Responder options and filters from the Microsoft Outlook toolbar.